Watch the peafowl but please do not chase them. Watch the fish, turtles and frog but please do not feed them. The rock walls are very old so treat them carefully. The flower gardens are special so only observe them. It is a peaceful place, so make only peaceful noises. Enjoy your picnic and pick up any trash. Kinder Outline – use this outline as an educational tool to introduce children to Mayfield. Print out the Mayfield Park Plant Map for a map of the Mayfield Park kinder tour. Print helpful NatureHuntWorksheet for the nature treasure hunt at Mayfield. Print helpful Kinder Nature Hunt Items to look for in nature. 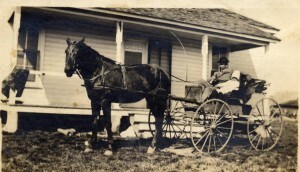 Print picture of Horse and Buggy Travel, which is on the bottom of this page. Bring several color cards for matching. Bring pencils and paper for extra drawing and rubbings. Idea – Bring clay for making forms. Welcome – Mayfield Gardens can be an adventure for all ages. Following are ideas for preschool children. What does “preserve mean”? Save and protect the garden, cottage, trees, flowers, rock walls. How do we treat things we want to protect? Respect – Let’s practice respect today. What does that look like? 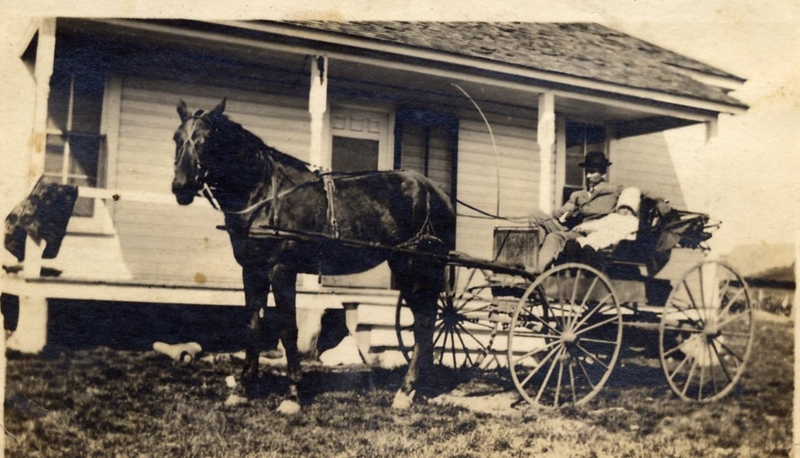 History: Mr. Mayfield bought the cottage and grounds a hundred years ago as a summer home. He lived in town and worked in Texas government with RR Commission and as TX Sec of State. The Mayfield’s had a daughter named Mary. She married Milton Gutsch. Dr. Gutsch was Chairman of the History Dept at UT. Mary and Milton moved into the cottage and added the porches. They built the gardens, walls and ponds with the help of a resident gardener. The family developed the site over a 62-year period. The peacocks were gifts from friends and their descendants are here today. After the Gutsches died, the city of Austin received the property to be used as a park. Use the handouts and color cards. Review what to watch for as you walk around house. This helps awaken children’s senses to the sights, sounds, and smells of nature around us. Who recognizes some trees? What tree has the big fan leaves? Walk the regular route and identify trees, flowers, etc. Look for Nature Hunt items. Who can name a couple fruit trees in the gardens? What kind of feet do we see in the animal world? What local critters have 4 legs? What has 2 legs? Identify some plants. What is characteristic of oleander, holly, etc.? Look at frog pond, Bell Trail, dovecote. Talk about pigeons. Look at drive and carriage house..
Look in ponds – carefully, get on knees and look in. Activity 1 Table 1: Draw something you see in pond – fish, lily, frog, turtle, etc. Look at other plants in patch gardens. Activity 2 Table 1: Do leaf rubbings. Discuss colors that everyone found. How many things did everyone find for the Nature Hunt? Recap – What do we call Mayfield Gardens because we want to save the cottage and maintain the gardens so more young students can visit and learn its history? Another possibility – bring clay to model fossil or other plant or animal.